Something strange is happening in Paris: The local newspaper Le Parisien discovered that in the last three years nearly 25 new boulangeries-patisseries opened their doors in the French capital. Most of them are not simple patisseries. Don’t get me wrong: Simple here in Paris means sophisticated. So if we're talking about “not simple”, it literally means very, very sophisticated. We are talking about what you would call a patisserie de luxe or haute patisserie. In the afternoons, you can see long lines of people queuing in front of Pierre Hermé or Philippe Conticinis Patisserie de Rêve. It looks like Moscow before the breakdown of the empire. Except that people here in Paris are not exactly queuing up for bread, but for sweets. Specials sweets. 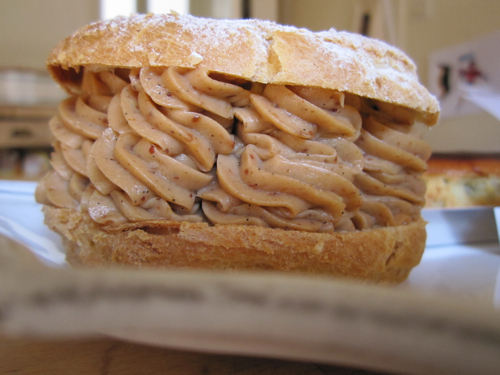 They want “the best chocolate” or they're simply crazy about the “Paris-Brest” in its newest, very exquisite version. Or they want a macaron, which renders them speechless. When Jacques Genin opened his chocolaterie-patisserie in the Haut-Marais, I first thought it looked like a very fancy fashion boutique. But on display in the windows weren’t the last fashion must-haves, nor fancy jewellery, it was just chocolate. Beautiful chocolate, indeed. I at first determined to boycott this kind of sophistication and not pay a Euro for a single piece of chocolate until the day I needed to by someone a present and bought a small box. The shopkeeper made me taste some and I couldn’t believe it. “This is better than Pierre Hermé”, I exclaimed. “Of course it is”, the guy replied dryly. Well, until that revelation I’d been convinced that Hermé was the top of the top. He isn't. Or let’s say, he has some stiff competition. Jacques Genin is a special person with a special ambition and he has, of course, his own (painful) story. After a violent childhood in the French provinces, he went to Paris, worked in restaurants, became chef, than pâtissier and opened a small atelier. For several years he has been supplying the best chefs (like Yves Camdeborde, Jean-Francois Piège and Eric Fréchon at Le Bristol) with chocolates, caramels and pastry, but was completely unknown to the public. 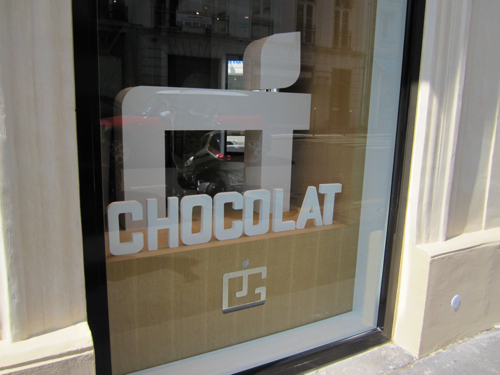 Since opening his chocolaterie in April 2008, a 400 square-meter temple to chocolate, this is no longer the case. 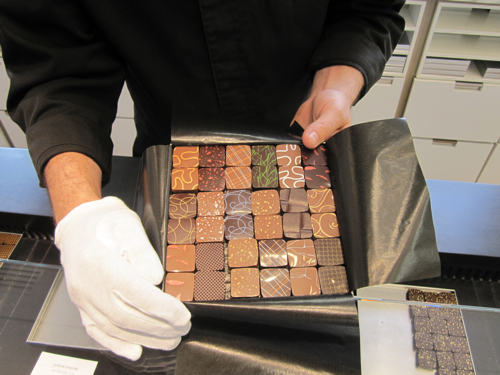 In very short time, Genin has become the most talked-about chocolate-maker of the moment. And this without being a qualified maître chocolatier but just a a self-taught and self-declared "rebel" whose career in food began not in a kitchen, but in a slaughterhouse. He does not want to be called a "master chocolate maker". He prefers to call himself a "factory man who works with chocolate“. 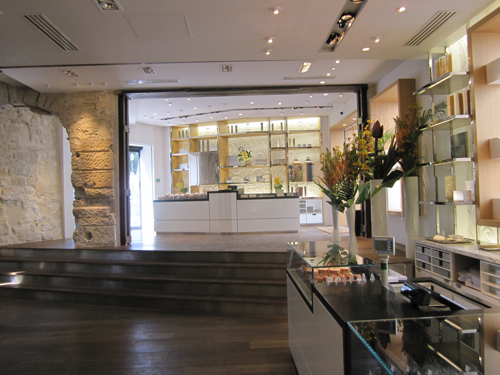 Now tout Paris rushes to his boutique to buy or taste his incredible chocolates. They come in a flat aluminium box, like a necklace. They are delicate and surprising. They are simply the best you can buy.